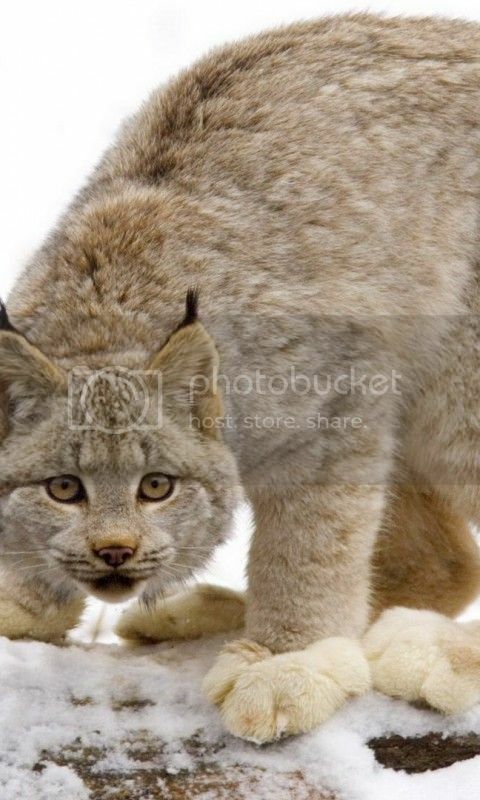 Mirjam is a Canadian Lynx that was born and raised in Inferni. Her main caregiver while she was young was Cotl Van Ulrich (who originally thought and spread the rumor that she and her siblings were bobcats) and she often was visited and cared for by Valkyrie De Le Poer. She used to think she was a coyote, like Cotl and Valkyrie are but Cotl pretty much beat that out of her at a slightly young age. Cotl also branded/tattooed her and her brother with the Ulrich "szeliga" tattoo that all of the Ulrich family has. Once Cotl perished, she and her brother(Feirefiz) were split between owners Lorelei Ulrich and Valkyrie. One day, Lorelei asked Mirjam to accompany her on a trip outside of Inferni, where she was given to Till Van Ulrich-Lykoi who she resides with today. Note: ICly, this creature is often referred to as being a "bobcat" because originally, Cotl thought he was caring for baby bobcats, when he really was caring for baby Canadian Lynxes. Her and her brother, Feirefiz are Canadian Lynxes, not bobcats. Seeing her shadowing Till , or Nephele. Having Seen her shadowing Cotl , Drystan , Lorelei , or Viktor . Armadillo (#48413a) ears, random striping on chest of head, aligning with spine, and tail tip. Also has assorted spotting of this color on shoulders and legs. Quincy (#5a432c) stripes on sides. Tattooed with Ulrich szeliga on inner left thigh. Distant with strangers, she is a very cautious and intelligent. She fluently speaks canine high speech but often will act like she is a normal feline with no knowledge of the luperci and their world. Mirjam is otherwise a very curious and often demanding of Till's attention. She is friendly with her core family, which she considers as such, because of the fact that she had been raised by coyotes and feels like she is different from other felines because of this. She is loyal to her clan, or pack, and often helps Till when hunting for their family or their pack. Hunting(master): one of the things she had actually learned from Cotl Ulrich was to hunt, and she caught onto it better than Cotl ever was at it so their training mostly went towards following a pack like formation rather than a typical cat-like hunting pattern. High speech(master): Speaks high speech fluently because of the exposure she had as a young kit to Luperci. She likes to speak in low speech because she knows that not all luperci speak it. Stealth (journeyman): She sometimes gets lazy and gets caught, but will act like she is just a regular cat, especially if she is unequipped with her harness. dislikes being shut in, being underground. Also dislikes being in cramped spaces. At about five weeks of age, her mother attacks members of the resident coyote clan and ends up dying. Ombre and Cotl adopts two kittens each from the litter, and she ends up going to Cotl. Mirjam is raised by the tattoo artist, who was pretty batshit at the time and wasn't always entirely helpful, or all there in the head.